In Maine, anyone using power tools to penetrate the ground (including homeowners) is required to notify DIGSAFE at 811 or 1-888-DIGSAFE at least 3 business days prior to digging. DIGSAFE will then notify the owners of underground facilities that are members of that system. However, not all owners of underground facilities are required to be members of the DIGSAFE system. 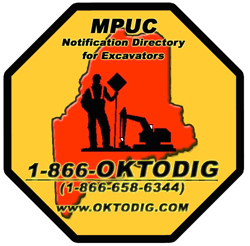 This directory, the Maine Public Utilities Commission’s “OK-TO-DIG” directory, provides contact information for the non-member, underground facility operators. You may also access this directory with a touch-tone phone at 1-866-OKTODIG (1-866-658-6344). In most cases, you must still notify DIGSAFE at 811 or 1-888-DIG-SAFE three days prior to digging. For more information about Maine’s Underground Facility Damage Prevention requirements, click here. Please note that while the Maine Public Utilities Commission (MPUC) has tried to make this directory as accurate as possible, it may contain errors and omissions. You should check this system prior to each excavation to ensure that you have the most accurate and up to date information. In addition, this directory does not include federally-owned underground facilities or underground facilities owned by individual land owners. You are also required to notify these entities. If you have any questions, please call the MPUC at (207) 287-3831 or toll free at (800) 452-4699.